The only wizarding bank available, with branches throughout the world. It's run by Goblins, and the currency used is metallic coins -- Gold Galleons, Silver Sickles and Copper Knuts. Dragon Feeder -- Feed food to the dragons. Pay: Fireproof robes and 7 galleons per week. The leading sellers of wands in Britain. Wand Woods: List of all wand woods. Wand Cores: List of all wand cores. A popular bookshop where most Hogwarts students purchase their schoolbooks. 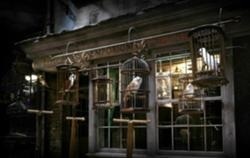 A pet shop located in Diagon Alley that sells owls and various other things needed for the care of owls, like Owl Treats. It sells a variety of breeds, including Screech, Barn, Tawny, Brown, and Snowy. Barn Owl - 10 Galleons. Brown Owl - 10 Galleons. Screech Owl - 15 Galleons. Tawny Owl - 10 Galleons. WonderWitch products, such as love potions and ten-second pimple remover. There is also a section of Muggle magic tricks in honour of their father Arthur. They're not big sellers, but they do fairly well. A popular Wizarding pub in London. It is the entrance to Diagon Alley. 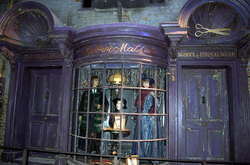 Sometimes simply referred to as Madam Malkin's, it is a shop in Diagon Alley. Students get their Hogwarts school uniforms there, and also dress robes, travelling cloaks, and the like. One of the shops where students buy their pets and supplies. Common Toad - 5 Galleons. Crested Toad - 9 Galleons. Harlequin Toad - 9 Galleons. Western Green Toad - 9 Galleons. Natterjack Toad - 5 Galleons. Black Cat - 9 Galleons. Ginger Cat - 9 Galleons. Siamese Cat - 11 Galleons. White Cat - 9 Galleons. Tabby Cat - 9 Galleons. A shop that sells cauldrons. A shop in Diagon Alley. 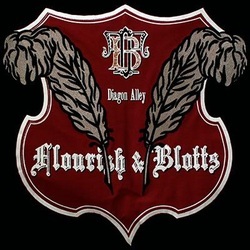 Its main products are things having to do with Quidditch such as Quaffles, Bludgers, and broomsticks. 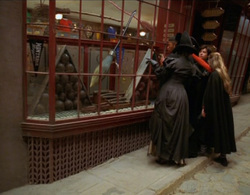 A shop in North Side, Diagon Alley that sells a wide variety of magical instruments. 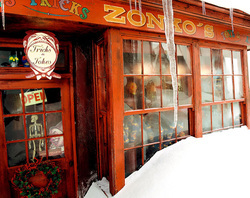 There is also a local branch in Hogsmeade. There are some more, less important shops in this alley. Only their names will be mentioned below, with a link to Harry Potter Wikia. 2nd Hand Brooms: A shop that sells used broomsticks. Amanuensis Quills: A shop in Diagon Alley that sells quills. It is next to Madam Malkin's Robes For All Occasions shop. 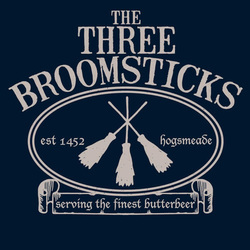 Broomstix: A shop that sells low quality broomsticks. Gambol and Japes Wizarding Joke Shop: A joke shop located between 'Obscurus Books' and 'Twilfit and Tattings'. Junk shop: A shop that sells secondhand items such as broken wands, lopsided scales, etc. Madam Primpernelle's Beautifying Potions: Located at 275 Diagon Alley, this shop helps witches getting rid of "warts and worse". 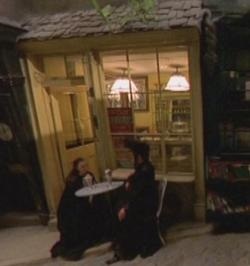 Obscurus Books: Located at 18a Diagon Alley, Obscurus is a Wizarding book publisher. Its range of titles include the popular Fantastic Beasts and Where to Find Them. Scribbulus Writing Instruments: A shop that sells ink and presumably other stationary items (quills, parchment). Secondhand robe shop: A shop that sells secondhand robes. Slug & Jiggers Apothecary: Where students buy their potion ingredients. Sugarplum's Sweets Shop: A shop that sells confections. TerrorTours: Located at 59 Diagon Alley, TerrorTours is presumably a travel agency for wizards and witches. The Ministry Press: A publishing house affiliated to the Ministry of Magic. The Daily Prophet's main office: Presumably where the Daily Prophet newspapers are printed. 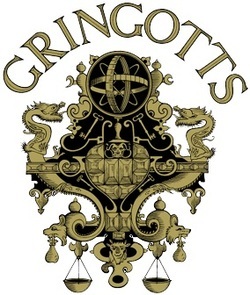 Twilfitt and Tatting's: Twilfitt and Tatting's is a wizarding clothing shop located in Diagon Alley. Given that it is favoured by elitist pure-blood witch Narcissa Malfoy, it is probably an upmarket shop. Whizz Hard Books: Located at 129B Diagon Alley. Whizz Hard Books is a Wizarding book publisher. Its range of titles include the popular Quidditch Through the Ages and Hairy Snout, Human Heart. Located at 13B, Knockturn alley, this shop sells all kinds of magical items including cursed and dark artifacts. A pack of bloody cards. An array of leering masks that line the walls. A pub where drinks are sold in glasses and in foaming pewter tankards. Soda with Ice and an Umbrella. A sweet shop that has the entrance to a secret passageway into Hogwarts in its cellar. Owners: Ambrosius Flume and his wife. Dervish & Banges - A helpful shop and sells and repairs some magical instruments. Dogweed and Deathcap - A Herbology shop. Dominic Maestro's - A music shop. Gladrags Wizardwear - A clothing shop that also sells very lurid socks, including ones that scream when they get too smelly. Hairdressing salon - Across the street from Honeydukes. Hogsmeade Post Office - The owl post office. Hogsmeade Station - The railway station. Madam Puddifoot's Tea Shop - "The haunt of happy couples". Usually couples go there on dates. Ollivanders Wand Shop - Local branch of the wand shop. 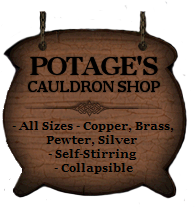 Potage's Cauldron Shop - Local branch of the cauldron shop. Scrivenshaft's Quill Shop - A shop for all types of quills. The Shrieking Shack - An infamous and the most frightening building in Britain. The villagers thought it was haunted, but they didn't know it was actually the werewolf Remus Lupin making the scary noises (it was where he went to transform). Spintwitches - A shop that sells sporting goods. 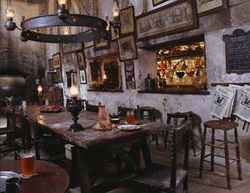 The Hog's Head - A dingy pub owned by Dumbledore's brother, Aberforth Dumbledore, which hosted a secret passage into Hogwarts created by the Room of Requirement. The Magic Neep - A greengrocer's. Tomes and Scrolls - A bookshop (est. 1768). 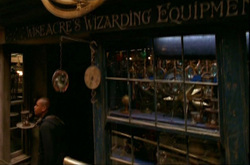 Wiseacre's Wizarding Equipment - Local branch of the magical devices shop. Wizarding Wireless Network Headquarters - Main headquarters of the popular radio station.